Etruscan Funerary Container, originally uploaded by Edith OSB. We went to the Vatican Museums forewarned that, no matter how much we tried, we could not see it all – and that the experience could be overwhelming because of the combination of quantity with variety of content. The predictions were accurate, but I had a wonderful day of being overwhelmed. Entering at 10:00 a.m., our ticketed time, I didn’t emerge until just before closing at 6:00 p.m. 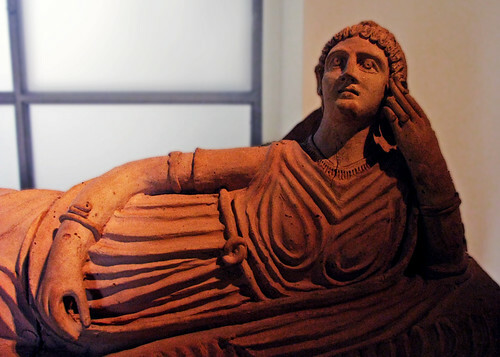 I headed first for the Etruscan collection on the upper level – the funerary container at the head of this blog comes form that collection – because I’m fascinated with this exquisite culture. For reasons obscure to me, the earliest Romans chose not only to defeat the peoples of Etruria in battle, but to obliterate their art, their crafts, and their culture. The Vatican Museums are reputed to have one of the best collections in the world; I hoped to really get a feel for the nature of this culture, and I was not disappointed. The collection included dozens of useful household items: beautiful bronze pitchers, very intricate gold work (including some bowls in which an inner and outer leaf of gold had been worked separately to produce a different design on the inside), beds, armor, tackle for horses (indicating, too, that they rode horses), and more. The first thing that caught my eye was the natural, rather than stylized, look to all they had done. The simplest items had small bits of decor. On one, for example, a pair of companions had their arms around each other’s backs; their faces were turned towards each other, and the animated conversation could be imagined: yet they were only about 6 inches high, and worked in iron. The Etruscan collection filled several rooms off the beaten track; it was not crowded, and provided a peaceful start to the day. Ready to head into the fray, I visited the Rafael rooms and the Modern Art collection before taking a break for lunch in one of the (blessedly) air conditioned snack areas. Invigorated, I headed out for the most hectic part of any visit to the Vatican Museums. The Sistine Chapel was as art-filled and overwhelming as predicted – and even more crowded than I expected. The museum guards attempt to maintain the silence that befits a place of worship, but this creates an unpleasant, punitive atmosphere that does not support the glory of the art work well. Most of the visitors, on the other hand, don’t give any evidence of recognizing that this Chapel is a place of worship. The only way to really soak in Michelangelo’s work is to somehow block out the ebb and flow of hubbub, the guard’s fierce SHHSHHH!!! I alternated sitting on one side or the other, moving down the length of the chapel. Still, I think I will ultimately learn more,and benefit more, from studying prints: it’s just not possible to view the images with any kind of receptive spirit in that atmosphere. After finding that the early Christian art area was inexplicably closed, I spent the rest of the afternoon in the Pinacoteca, the “picture gallery” where room after room included works of art from the 12th century forward. A few were familiar from photos; many were new to me – and I could have spent hours contemplating them. The last thing I saw was the famous double-spiral stair case. Two interlocking spirals seem to form a single stair; however, those going up will never encounter those who are descending. Photos don’t capture the real experience: the steepness of the descent (safety barriers are installed at the top) or the strange realization that half of the stairway is empty. I haven’t even mentioned the halls of maps, tapestries, and more. 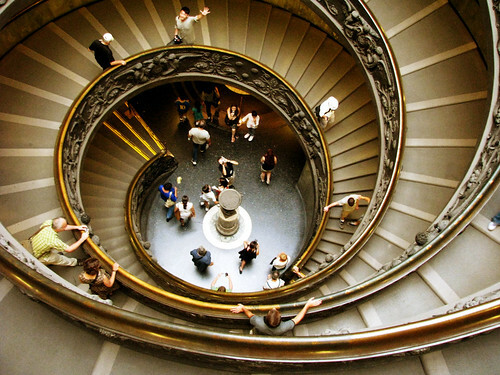 The Vatican Museums give ample evidence of the Catholic intellectual tradition: the appreciation and willingness to preserve and transmit ideas and artistic creations from all over the world. Such exquisite photos and writing. I enjoy visiting Rome with you Sister Edith. I envy you those seats in the Sistine Chapel. None were available when Bill and I visited last October.